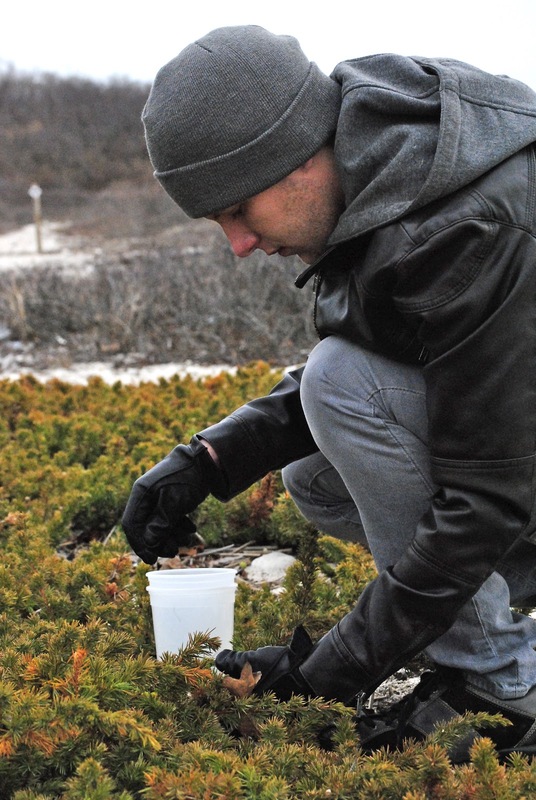 The Juniper is a fascinating plant, with a wide and varying range of species. The coniferous plants are part of the Cypress family and grow to be as tall as a 140 ft. tree, or a low lying shrub with long trailing branches. I honestly hadn't given much thought to this humble plant until my recent discovery. I had cooked with juniper in the past, but it was typically reserved for the occasional venison or wild game dish, never much beyond that. Green juniper was the main component in the liquor known as gin, developed in the Netherlands in the 17th century. That was the extent of my knowledge on the subject. I first spotted the shrub at a nearby beach I frequented. I had seen the juniper many times, but never really took notice until I spied the large grape-like berries hanging from it's sprawling branches. 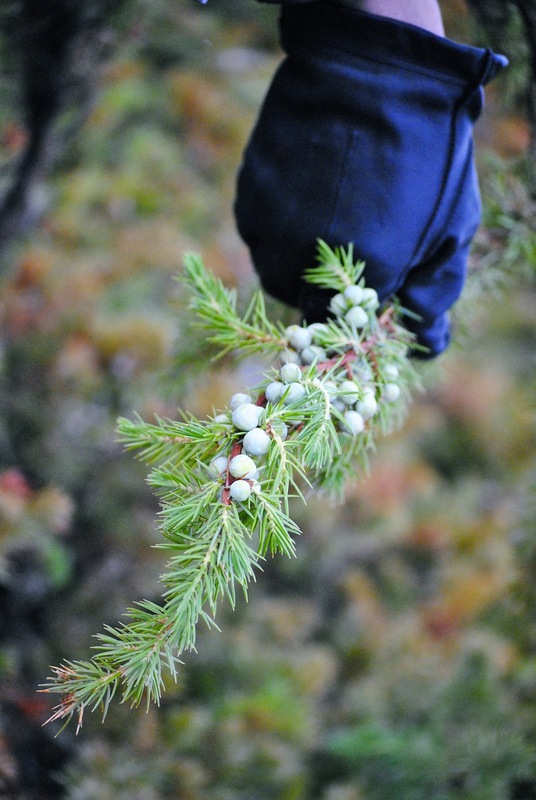 The juniper grows both green (un-ripe) and mature berries at the same time, even on the same branch. This particular plant had many more green than ripe purple berries, most likely due to the time of year. It was here that I made an important connection that these green juniper berries were not only also edible, but highly delicious. The berries are not actually berries at all, but instead a seed cone - very compacted and fleshy. It is interesting to note that juniper berries are the only spice derived from conifers. All junipers grow berries, but many are too bitter to eat, and some varieties are even toxic. I identified the plant I pick from as Juniperus Communis, which is luckily the variety used in gin. The un-ripe green berries are seldom used and never sold commercially. Only the dried purple berries are available in stores. The green juniper is only used (at least according to my own research) in the production of gin. Where it differs from the dried version is in its fresh piney flavor. When it is green, it has a clear, citrusy, herbal note. In my opinion, the fully ripe berries just don't compare. I immediately fell in love with their unique flavor and my mind began to reel of the dishes and applications they could become. I knew I needed to collect these gems before they matured and lost their youthful zing. I set to the task of herding the berries into my quart container. The berries were enrobed in sharp prickly needles, so it was necessary to have thick leather gloves on when picking them lest you be stuck many times. I'm excited to announce that not only will these amazing seed pods be the star of a future post, but they will soon be available in the Cooking Curiously store for purchase! Stay tuned for their arrival in the shop and a writing piece devoted to their uses and deliciousness.